At precisely 42 seconds past 5.30 PM this evening (on Aug 20, 2014) the Earth will complete it’s thirtieth revolution around the Sun with me on it. I have spent the past four hours reading about what it means to people when they exit their twenties. 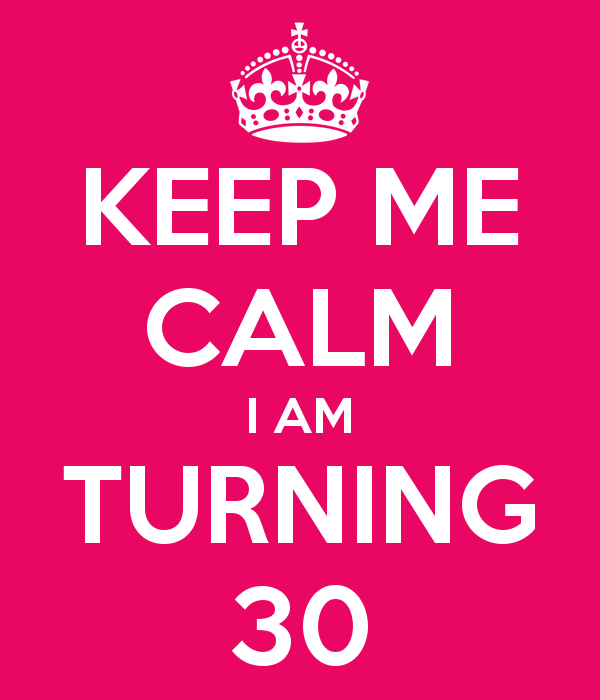 Turning 30 is supposed to be a big deal, an achievement of sorts, having survived tsunamis, earthquakes, riots, murderers, diseases, ninja assassins and of course, traffic. It is also supposed to signify the fact that I’ve officially a grown up and cannot rely on my youthful ignorance as an excuse when I screw up. I am supposed to be responsible, financially and emotionally stable, be able to hold down a job for more than three months and not throw boogers at passersby. I am not supposed to scratch my balls in public and have random fits of paranoia causing me to run down the road naked, dodging invisible aliens. I am supposed to be mature enough to realize the difference between right and wrong, morals and immorality, black, white and grey, and most importantly, coffee and tea. I am supposed to start leading a healthier lifestyle – no more smoking, no more drinking binges and definitely no more weed. I am supposed to drink lots of water and work out regularly to ensure that my first heart attack happens only three decades from now. I am supposed to be a strong pillar of support for my parents, be able to provide a good quality of life for my wife and be a responsible role model for my younger brother. I am supposed to be mentally strong to deal with the real world and I am not supposed to get depressed with the fact that I am growing old and am one year closer to death. When I look back on the things I’ve done during the past three decades, I am surprised at the level of ignorance, insensitivity and intolerable cruelty that I have exhibited at times. I am also surprised at some of the intelligent decisions I’ve taken, something I was not sure I was capable of. I’ve alienated people, I’ve infuriated those who love me and I’ve driven others to murderous rage. I can think of people who would put a bullet through me right now given the chance. I can think of people who would walk past me on the street and pretend to not recognize me. I can think of people who would smile at me and stab me in the back with the metaphorical knife when I turn around. But I can also think of people who would love me unconditionally and take me in as a part of their family. I can think of hundreds of people who would still acknowledge my existence without any animosity. In a world filled with hate and anger, where people are being slaughtered each minute, the fact that one insignificant boy in Bangalore has grown up and turned thirty should not make a difference. But when I look at the journey I’ve been through to get here, I am overwhelmed. I am moved to tears at the kind of experiences I’ve had – the good, the bad and the ugly ones. We all have fantastic experiences in our lives every day. Each moment of joy we experience means so much to us that it’s hard to imagine hordes of such people being killed. Millions of dreams and hopes being crushed every single minute by people pursuing theirs. I ask myself if it’s all worth it. Is it worth having a really ‘happy’ birthday when there is so much grief all around us. Or maybe, these tiny sparks of happiness keep the world turning. We are all allowed meaningless rants straight from the heart, once a year. Today is my turn. As I see the clock inch closer and closer to the hallowed hour, I am filled with a little hope about hope.